or the amount of the fee permitted pursuant to 38-37-104(1)(b)(I), whichever is greater. *Original Principal Balance or Outstanding Principal Balance of the Promissory Note- whichever is less. * The Public Trustee shall also collect $13.00 per document plus $5.00 for each additional page for recording with the County clerk and Recorder pursuant to §30-1-103 and §30-10-421. C.R.S. 38-37-108: All moneys payable to a public trustee at any foreclosure sale under the provisions of this article or upon redemption or cure pursuant to article 38 of this title shall be in the form of cash, electronic transfer to an account of the public trustee available for such purpose or a certified check, cashier’s check, or teller’s check, or draft denominated as an official check that is a teller’s check or a cashier’s check as those terms are defined in and governed by the “Uniform Commercial Code”, title 4, C.R.S., made payable to the public trustee and certified or issued by a state-charted bank, savings and loan association, or credit union licensed to do business in the state of Colorado or a federally chartered bank, savings bank, or credit union. C.R.S. 30-1-108: All officers of this state who are required to collect fees for their services are required to make fair tables of their respective fees, and keep the same posted in their respective offices in some conspicuous place for the inspection of all persons who have business in said office; and, if any such officer neglects to keep a table of fees posted in his office, such officer, for each day of such neglect, shall forfeit and pay the sum of five dollars, to be recovered by action at law before the county court for the use of the county in which the offense has been committed. C.R.S. 30-1-116(1): Every officer shall collect every fee, as prescribed, for services performed by him in advance, if the same can be ascertained, and when any officer negligently or willfully fails to collect any such fee, the same shall be charged against his salary. Cashier's Checks and Teller's Checks must be made payable to the Public Trustee and must also be issued by a financial institution as defined in section 15-15-201 (4), C.R.S. 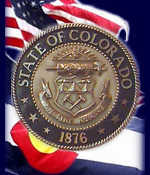 *, licensed to do business in the state of Colorado.